The only input requirement is table salt, water and electric energy which can be generated using renewable source. The power rating (kW) and the energy capacity (kWh) can be independently scaled depending on the need. No toxic chemicals or rare metals used. Even if the battery leaks, the chemicals (acid, base and salt) are environmentally benign thus safe. The levelized cost of energy storage is on par with the current battery solutions. 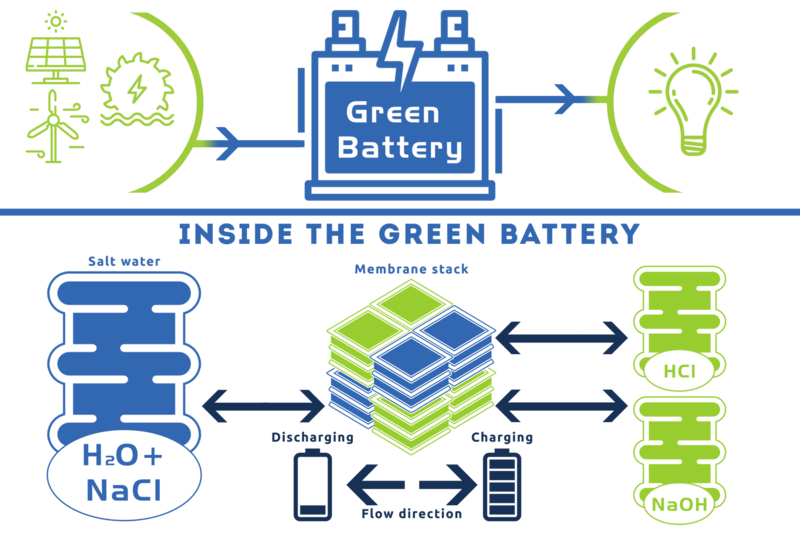 The membrane stack in the green battery, along with the anion and cation selective membrane, contains bipolar membrane. This special selective membrane, under electric field, separates the hydrogen (H+) and hydroxyl ions (OH-) from the water (H2O). During the charge phase the concentrated salt solution will generate base and acid solutions owing to the bipolar membranes. This process is known as bipolar membrane electro dialysis. The salt, NaCl, is converted in NaOH and HCl solutions. During the discharging phase, the base and acid solutions formed will flow back trough the membrane stacks generating a concentrated salt solution and releases energy in the process.